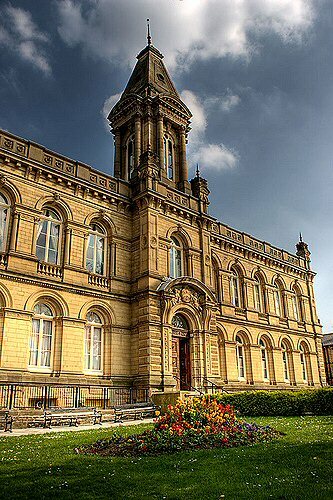 Saltaire is a suburb of Manchester around 3 miles NNW of the city centre. It is designated a UNESCO World Heritage Site, it's also an anchor point on the European Route of Industrial Heritage. It is a Victorian model village built in the 1850's, copying in some ways the cotton milling village of New Lanark Cotton Mill Village, Lanarkshire. It was constructed for Sir Titus Salt who at the time had 5 woollen mills, moved his business to a new larger mill at Saltaire and built the model village for his workers. This larger mill was by a river, canal and railway. The model village includes neat stone houses for his workers (much better than the slums of Bradford), wash-houses with running water, bath-houses, a hospital, as well as an Institute for recreation and education, with a library, a reading room, a concert hall, billiard room, science laboratory and gymnasium. The village also provided a school for the children of the workers, almshouses, allotments, a park and a boathouse. He built the congregational church and the mausoleum next to it, where Sir Titus Salt was buried, and donated the land where the Methodist church was built. 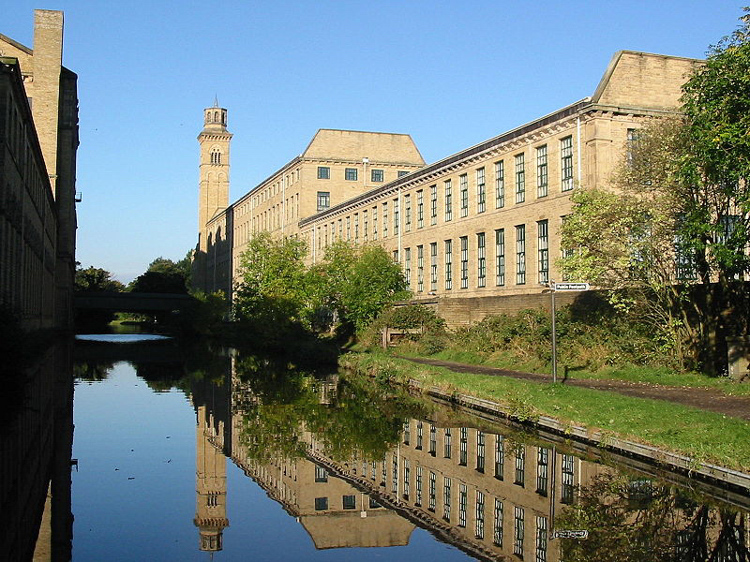 The name Saltaire is a combination of Salt after Titus Salt and Aire after the River Aire it stands near. Just prior to this Titus had been campaigning to clean up the quality of the air in the areas around so it may have had a second meaning. The streets are named after the members of Titus's family. Titus Salt was born in Morley near Leeds, 20 Sept 1803, he went to Batley Grammar School, his father Daniel being a fairly successful businessman. He became his fathers partner having first worked for 2 years as a wool-stapler (dealer in wool). This business 'Daniel Salt and Son' worked with Russian Donskoi wool, which was widely used but not in worsted cloth. Titus went around the spinners in Bradford attempting to get them to use it in Worsted manufacture, with no success, so set up a spinning and manufacturing business himself. In 1836 Titus came across some forgotten bales of Alpaca wool in Liverpool, and after doing some experiments with some samples bought the consignment, using this he became the creator of what was to become a fashionable cloth called Alpaca. In 1833 he took over the running of his fathers business and over 20 years expanded it to the point where he was the largest employer in Bradford. Titus Salt became Mayor of Bradford. The smoke and pollution emanating from local mills (factories) in Bradford was acknowledged to come from the many factory chimneys and Salt tried unsuccessfully to get this pollution cleaned up using a device called the Rodda Smoke Burner. Two years later in 1850 Titus decided to move his manufacturing from a number of mills to one larger site next to the railway, canal and river, 3 miles from Bradford on land he had bought. He opened it on his 50th birthday with a grand banquet in 1853. At this time it is said to have been the largest factory in the world. He then built a model village for his employees (see above). He was Chief Constable of Bradford before its incorporation as a borough in 1837. Later Deputy Lieutenant for the West Riding of Yorkshire. In 1857 he was President of the Bradford Chamber of Commerce. Liberal Member of Parliament for Bradford from 1859 until he retired through ill health on 1 February 1861. In 1869 he was created a Baronet, of Saltaire in the County of York. He died at Crow Nest, Lightcliffe, near Halifax, West Yorkshire in 1876 and was buried next to Saltaire Congregational Church. It is said that over 100,000 people lined the route of the funeral procession. It is said that Salt was teetotal, but there is no evidence of this, except that he forbade beershops in Saltaire. At the opening of Saltaire he told Lord Harewood that he built it 'To do good and give his sons employment'. Some now site it as Salt's philanthropic project and an example of paternalism, but it just probably made commercial sense to him at the time and was in line with his own ideals. It was then run by his son, also Sir Titus Salt, after his sons death, Saltaire was taken over by a partnership that included James Roberts. Roberts came to own Saltaire. He is another interesting character of history. He endowed a Chair of Russian at Leeds University and bought the Brontë's Haworth Parsonage for the nation. Titus Salt MP for three years. Lord Wallace of Saltaire (House of Lords). Richard Corbett MEP (European Parliament). Chris Leslie MP (House of Commons until 2005). Congregational Church now United Reform Church. There is festival in September each year. A660 north from Bradford, turn right onto A667, Saltaire is now on the left. Mill building, may be more than one, church, mausoleum, almshouses, houses of different designs.